Just What Does AI Mean and Does it Matter? When we say AI, depending on your age you will either think of Metropolis, Hal from 2001 or Terminator. What you might not think of is a calculator but in essence AI right now is a computer doing something really really fast – just like a calculator. From little Acorns grow…! AI is hard to define but the best definition I have seen is this; Computer Looks at loads of data using human defined algorithms – Computer Learns and adapts original algorithms – computer equals Artificial Intelligence. Most of what we see today is only at step one; decision support, image scanning, analytics, etc are using the immense and increasing power of computers to do in seconds what would take humans hours, days even years to do. So that is not to be sniffed at – but is it AI? And more to the point does it matter? Microsoft’s CEO has said artificial intelligence has the potential to “change the trajectory of healthcare” if it can be scaled successfully across the NHS. “The biggest proviso is seeing this all, in action – how is the technology all being used? Now of course AI is developing and there are real examples of Computer Learning and without question we stand at the precipice of a huge leap forward in how we use and interact with computers in every aspect of our lives. Amazon seems to know what I want to order before I do, I see suggestions for movies, holidays and recipes pop up on my multiple screens all the time and I think “how does IT know?” – who IT is I don’t seem to know, but IT sure is clever. It is a worry for many people and we feel that our lives are being invaded, controlled even, but we then appease our fears when we get cheaper goods and services delivered in the blink of an eye. We see and feel the benefit every day across of lives so we feel better about IT. In healthcare we see computers being used every day, throughout every interaction to record data which for years sits in a database, never talking to other databases but at least it’s safely stored away. We are thus more wary of it since we don’t see and feel the same benefit, we also worry about our health data being shared or lost more than losing our credit card details. Whilst we might be happy to use tools to help us keep well and deal with minor ailments the same is not true when we are truly ill or suffering, we need that connection with a person and group of care givers. Healthcare needs Human interaction. So back to Microsoft’s point, how do we use this technology, what role does AI play, will we see automated Doctors capable of a full consultation and diagnosis? For me the answer is Yes and No. Yes it will be capable, but I hope we don’t lose that human connection that we need and grave as a species. AI has the power to aid and assist our care givers, Decision Support for example should be the same as your Doctor sitting down and consulting with the best medical minds in the world, trawling across shared knowledge and learning and coming up with the best consensus diagnosis and treatment plan available. Your Doctor will be able to do that from their tablet in moments via AI, as the data grows so the system learns more answers. This is a key point, machine learning relies on data to learn and adapt, let alone simply store good answers to questions. Data is spread across multiple systems right now and that is one of the biggest challenges in healthcare today – it is a much discussed topic and so we don’t need to replay it here, needless to say systems must share. Human interaction will elicit the best data possible, through questioning, observing and testing so we must make it easier to record data from multiple sources and input methods into the database feeding AI. Doctors needs to be able to work the way they do now; talk, dictate, type, draw pick lists whilst working with the patient – not with their back turned while they type endlessly into an electronic health record that sits forever in the proprietary system supplied to the Hospital – but at least its electronic and safe right? AI needs to be fed and the best way to feed it is via human and machine interactions. Data from across the care continuum is valuable so long as it is valid and structured so let’s make it easier for Doctors, Nurse and Care givers to record that data at the point of care in a mobile way – the way they live their life outside of work. We don’t have to worry about the term Artificial Intelligence and what it actually means to benefit from the immense processing power IT offers. Furthermore we need to accept that every vendor is going to use AI to describe one part or other of their solution – so what? 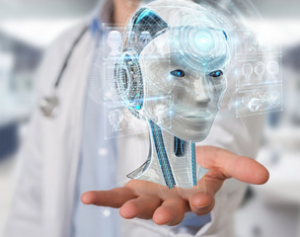 The one thing we do have to agree on though is that machines, machine learning and AI need to support and enhance human interactions to deliver the most effective and compassionate healthcare system we, as humans, deserve.